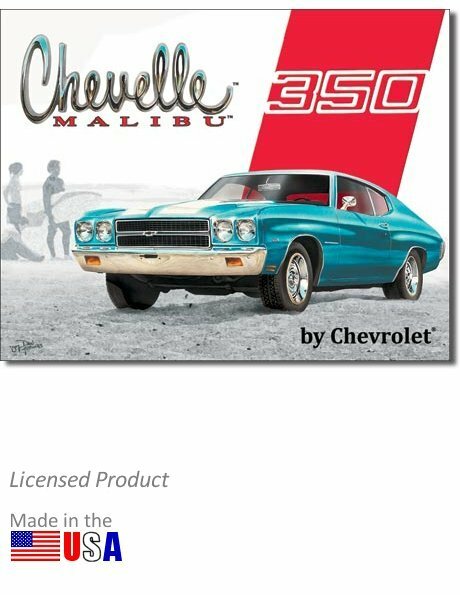 Chevy Malibu owners and enthusiasts will love this beautiful tin metal reproduction of a 1970s advertisement, promoting the Malibu with the Chevy 350 V8 engine. A great piece for your garage or home office's wall, and it also makes the perfect gift for any occasion for the classic Chevy Malibu owner or enthusiast. This is a metal sign, made in the U.S.A. Measures 16 inches wide by 12.5 inches high. UPC: 6-05279-11491-7 | Part No. 1491. Ask a question about "Chevelle Malibu 350" Tin Sign. The item was shipped in prestine condition and is exactly what we wanted. This was a gift for a family member and they were very pleased. The item arrived in a few days and bank transaction went through very well for payment.Would highly recommend this company.